ONE of the biggest changes in the publishing world has been the shift from the traditional printing and distribution of book in the digital era – and podcasts are embracing that change. There are a host of fiction-related podcasts and, as you might expect, the science fiction field is at the forefront, cutting the digital edge. 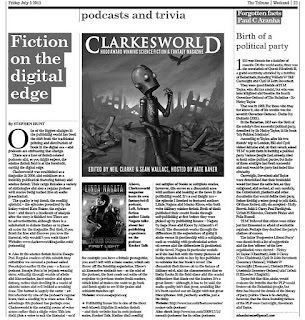 Clarkesworld was established as a magazine in 2006, and continues as a monthly publication featuring fantasy and science fiction. Their range includes a variety of anthologies and also a regular podcast with stories being turned into an audio presentation. The quality is top notch, the reading splendid – the episodes presented by the honey-voiced Kate Baker, the regular host – and there's a modicum of analysis after the story is finished too. There are no advertisements, although there is a solicitation to donate money or to place an order for the magazine. But then, if you listen for free and discover you love the material, why wouldn't you want more? Also in the science fiction field is Escape Pod. Regular readers of this column may remember we covered a podcast called Pseudopod earlier in the year – a horror podcast. Escape Pod is its jetpack-wearing sister, whizzing through worlds of aliens and mirrorshades, hard science and space fantasy, rather than dwelling in a world of ancient tomes and evil behind a creaking door. The format is largely the same – an introduction by one of the podcast's regular hosts, then a reading by a voice actor. One advantage this podcast has perhaps over Clarkesworld is the rotating roster of voice actors rather than a single voice. This lets them pick a voice to suit the material – so if for example you have a female protagonist, you aren't left with a male reader, which can throw off the listening experience. There's an interactive element too – at the end of the podcast, the host reads out some of the response to previous stories from readers, which kind of makes me want to go back and listen again to see if the praise and criticism matches up! Publishing house Tor is one of the most well known imprints in science fiction – and their website has its own podcast series, Rocket Talk. Rather than reading out samples of books or complete stories, however, this serves as a discussion area with authors and looking at the news in the publishing world. It's a real insight too – the episode I listened to featured authors Linda Nagata and Marko Kloos, who both write military science fiction. Both of them published their recent books through self-publishing at first before they were picked up by publishing houses – Nagata by Saga Press and Kloos by Amazon's 47 North. The discussion works through the differences in the experiences of going it alone versus in partnership with a company, such as working with professional artists on covers and the differences in promotion of the novel. Nagata in particular sounds as if she had fun with the many pictures of hunky models sent to her by her publisher to consider for her book's cover! The discussion then moves on to the nature of military sci-fi, and the characteristics that so many books in the field share and the crucial differences that mark out the leaders. It's a great listen – although, it has to be said, the audio quality isn't that great, sounding like it's been carried out on Skype with not great microphones. Still, perfectly audible, just a bit tinny. Also check http://www.tor.com/2009/12/14/torcom-podcasts/ for its other podcasts.